In the lifetime of most OWs, there will be few who have made as great a contribution to the Association and the Whitgift Sports Club as Gerry whether on the pitch as Captain of the 1st XV or on the touchline in later years, frequently collecting the corner flags after the match. Gerry was the driving force behind the introduction of Junior Rugby which today provides coaching for over two hundred youngsters from 6 to 16. He was always happy to take on any task that would help to ensure the well-being of Croham Road, providing encouragement and, frequently, employment to those who needed a start en route to a career and financial assistance to many. He was Chairman of the Benevolent Society and President of the Association in 2002. The wonderful tribute, written by Nigel Platts, and which was circulated to members, says it all. Now, Whitgiftians of all generations have the opportunity to contribute to a lasting memorial to this special OW. It is one that Gerry would enthusiastically support and that will ensure the Clubhouse continues to be a welcoming place for OWs and their guests. And, importantly, one that will help to attract much needed revenue from outside lettings in order to meet the ever increasing costs of providing sport for OWs and the Community in the years to come. We have already achieved some success in our fundraising effort with an Award of £7,500 from the Rugby Football Union. With your help we can reach our target of £30,000. You will not have a more compelling reason to support your Club. There was no one more committed to Croham Road than Gerry. Therefore, it seems entirely fitting that, following the refurbishment of the Main Hall, it will be re-named “The Gerry Bowthorpe Room” as a lasting tribute to this truly outstanding Old Whitgiftian. The scale of the project will, of course, be determined by the financial success of the Appeal and we have been realistic in our planning, taking account of the current financial climate. Apart from the installation of new double glazed windows, no major improvements have been made to the Clubhouse in the past twenty years. To meet the demands of today’s potential customer, whether for a Wedding Reception, Birthday Celebration or Corporate event, it is essential that we improve the premises. So, that outdated laminate wall panelling will go, the ceiling will be lowered and new general and decorative lighting added. The fireplace, once a feature, will be reinstated. Big screen, audio visual equipment, vital for Company meetings, will be installed (ideal for watching Rugby Internationals too!) and a new and appealing colour scheme introduced. This is an exciting project and your comments will be most welcome … as will your donation! It is almost certainly the first time you have been asked to make a financial contribution to the Club since leaving School, apart from the annual subscription. A detailed plan showing the proposed work is displayed in the entrance hall of the Clubhouse. Please support “The Gerry Bowthorpe Room Appeal” by completing the Pledge Form. 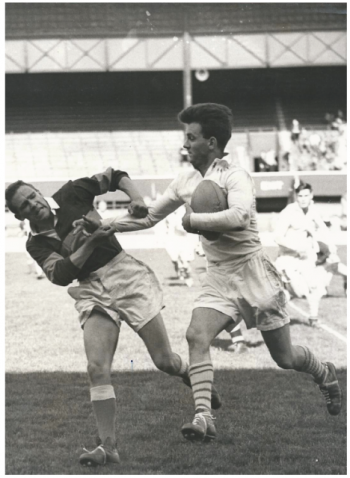 Gerry handing off an opponent whilst representing England schools at Twickenham in 1957. 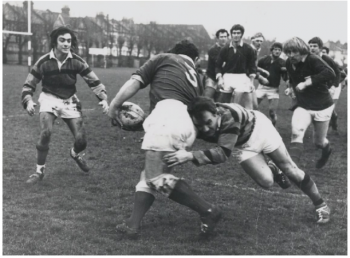 The trademark Bowthorpe tackle during a first XV match against Streatham and Croydon at Frant Road.